One woman wants to uncover the truth about her family history. Another guards her secrets in order to stay sane. When Julia Rosenthal returns to England and visits her suburban childhood home, the memories and unspoken tensions of family life come flooding back. Looking for clues and determined to find some answers, she tries to make sense of her odd childhood and understand why her free-spirited brother has a much easier relationship with her teenage daughter. In a different place and time, Julia's mother struggles to tell her own story, gradually revealing the secrets of her early years in wartime Germany—secrets she has carried through the century—until past and present collide with unexpected and haunting results. This gripping and beautifully crafted post-Holocaust novel unravels the impact of a war that resonates across generations and interweaves universal themes—the nature of identity, the meaning of family, and the emotional legacy of the past. 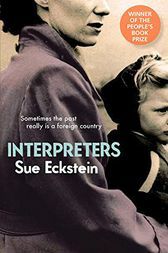 Sue Eckstein (1959-2013) worked for VSO for many years in London, Bhutan, and the Gambia, lectured at Brighton and Sussex Medical School, and had a DPhil in creative writing from the University of Sussex. Her plays include The Tuesday Group, as well as Kaffir Lilies, Laura, and Old School Ties. She is the author of The Cloths of Heaven, which was serialized on BBC Radio 4 Woman's Hour in 2010.